For this project for The Cutting Cafe design team, we worked with the Fun With Rosettes file. It has the option to make various sized rosettes and with a straight or scalloped edge. I also used the Gift Card Holder Set file. Be sure to visit the blog on the 7th and 21st of each month as we post design team projects on those days. Leave a comment and you will be eligible to win three free files on the next post. Hey everyone! 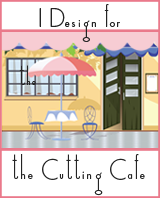 I am here with a quick project for The Cutting Cafe. This post we are still doing Christmas in July. I chose the 3D Ornament file as it is a very quick but cute. I am on vacation and cut the pieces out to take with me to put together. The set has circles and an ornament base. You fold the circles in half and glue together side by side. Use more circles for a fuller ornament. When I return home, I will glitter the edges which will add a glittery touch. Tie a ribbon or hanger on the top and you are finished.